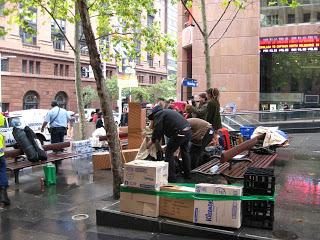 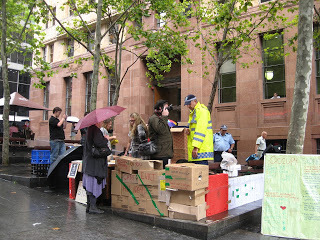 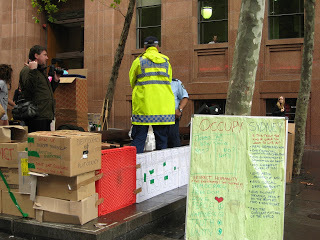 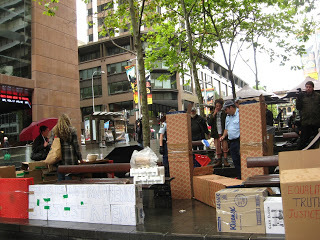 Occupy Sydney during 2011-12 defined their points with recycled cardboard boxes on Martin Place, a pedestrian area in downtown Sydney. 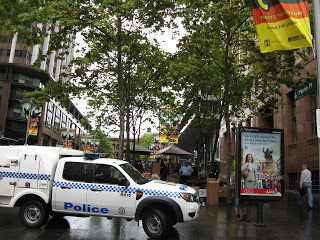 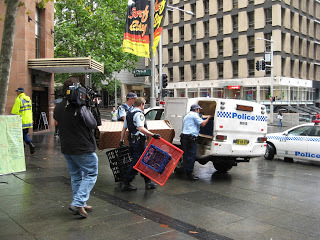 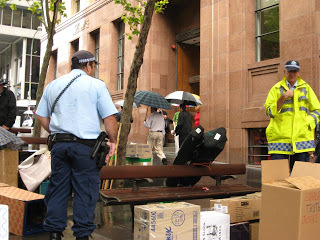 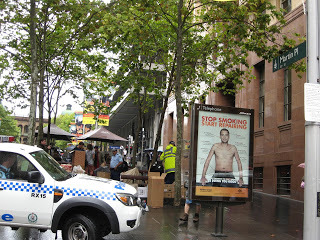 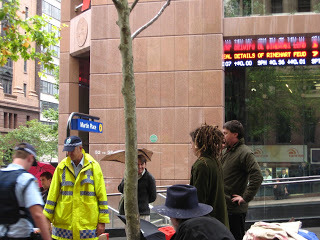 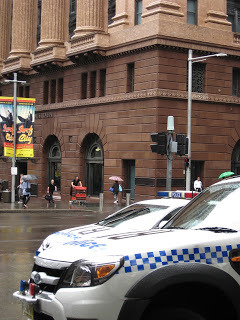 On this rainy day, I watched while police systematically dismantled the cardboard box barricades and the Occupy Sydney team responded by hastily shifting position, moving their cardboard space definers to confound the police. 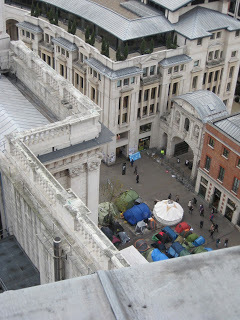 Three months earlier, in November, 2011, I’d visited the Occupy London semi-permanent base camp of tents around St. Paul’s Cathedral. 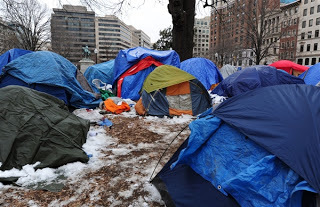 During 2011 and through the winter until June, 2012, Occupy DC protesters in Washington, DC settled in tents or tarpaulin structures in McPherson Square. 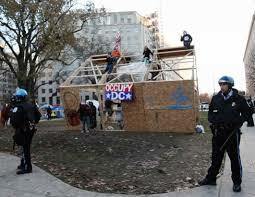 By Spring, the Occupy DC movement had built wooden structures on the public park. 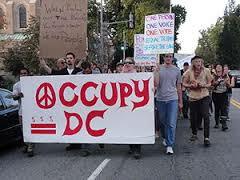 See: Amendment 1, The Constitution of the United States of America. 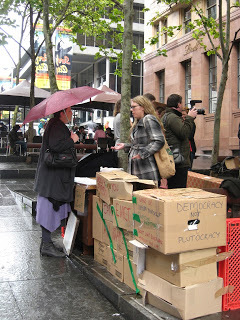 Freedom of religion, speech, and the press; rights of assembly and petition. 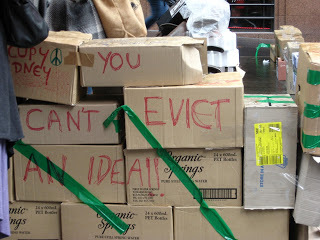 Congress shall make no law respecting an establishment of religion, or prohibiting the free exercise thereof; or abridging the freedom of speech, or of the press; or the right of the people peaceably to assemble, and to petition the government for a redress of grievances. 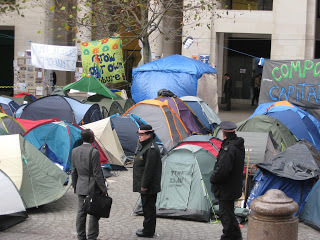 Forced removal of Occupy DC in 2012.